Enjoy 4 days as a family while adults practice yoga twice a day, and the kids enjoy tennis club, walks in nature, gardening & fruit picking, and more. The perfect mix of fun and relaxation in a stunning setting, for the entire family. Very often guests on our yoga retreats wish they could introduce their families to the beautiful Soller Valley and the magic they experience during their stay at Finca Son Salas, the stunning 17th century farmhouse where our retreats are held. The house very much caters to families, with a gorgeous pool, tennis court, basketball, cinema room, billiard table, swings, pingpong table, vast gardens, and more. Adults are free to use the tennis court when it is not being used by the kids tennis club. Tennis rackets and tennis balls are provided. All meals will be vegetarian, based on fresh seasonal fruits and vegetables, many of which are directly sourced from our organic garden. We cater to intolerances and dietery requirements. All rooms are large double bedrooms with ensuite bathrooms. We have single beds which can be added whenever needed. The term child refers to children under the age of 12. Feel free to contact us for special requests. Please bring your mat and some sports shoes to take advantage of our tennis court, go for a walk or hike! Depending on the weather, you may be able to swim! If you do not wish to bring your own mat, yoga mats will be provided. 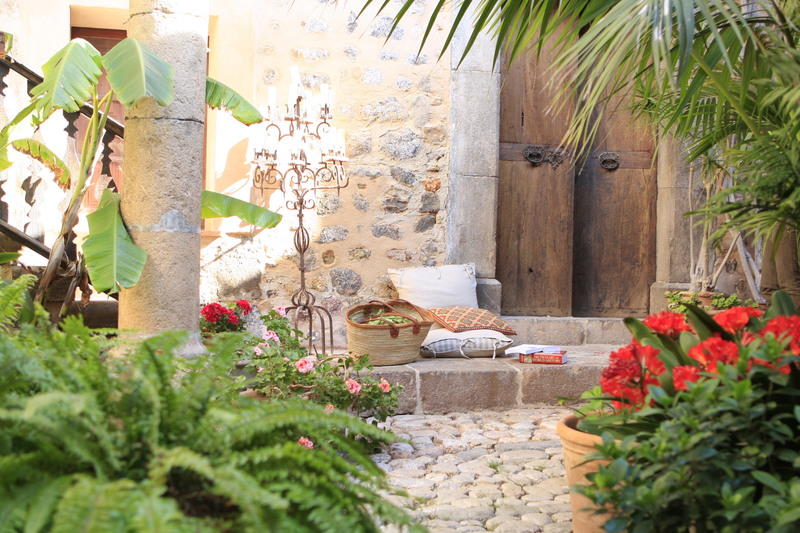 Our retreats run in the idyllic Finca Son Salas. Sitting on 50 acres of beautiful, wild unspoilt nature, you are surrounded by ancient olive trees, lush gardens, almond and orange groves. Dating from the 17th century, the luxurious estate which was once an olive oil producing farm has been restored to the highest level, while preserving original fittings, including the once donkey-operated olive press. We design our retreats to allow for some down time and time for self reflection. Whether you would like to read a book by the fireplace or under a tree, take a nap or take a walk through the olive groves, lounge by the pool, or even challenge one of your fellow yogis to a game of tennis (tennis rackets and balls available free of charge), the possibilities are endless. You can of course also venture outside the Finca if you so chose, and explore the beautiful Soller Valley and neighbouring villages, including Deia and Fornalutx, or head to the port of Soller. Any questions you may have or any way we can help you plan, don’t hesitate to ask! Getting here. Finca Son Salas is a 25 minute drive from Palma de Mallorca airport. Easiest way to get to the venue is by taxi. Renting a car is strongly encouraged should you wish to explore the area.